Other commenter bought the mini covert, it is junk. There is also a larger sized AF folder and its name escapes me but it is uncommon. 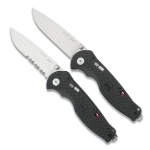 Mine is the COVERT with black blade and double bevel. It is strictly a defensive edc so I shatpened the other side. 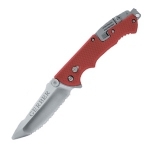 The knife is ideal for that purpose because it has a secondary lock to the liner lock and also accomodates a reverse grip. I like it a lot. It is not a general purpose knife! As an aside, Boker seems to be licensed to make fixed blade version of this design. 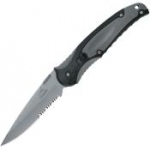 I bought an Applegate-Fairbairn "Mini Covert Serrated" knife from a PX. To be honest the main reason I bought it was there was little to choose from and the previous Gerber knives I had were good. This one was not good. Maybe it was a Friday job, I don't know. I do know it was one of the dullest knives out of the box I have ever purchased. As time went by the handle seemed to flex, maybe this was because I carried it in my waist band and under my belt, a minor issue that I hasn't effected its use. Not sure what the handle is made of, some type of composite? The big problem I have with it is the locking mechanism doesn't work well. The first problem is with little pressure on the back of the blade, the lock will give and the blade will fold. The new issue I'm having is when I try to cut something that requires pressure on the edge, for example plastic wire ties, the in handle lock will actually slide past the base of the blade and lock the blade open. Finally, and this is my frustration with most knife makers, why do they bother putting less than 2 inches of a serrated edge on a knife blade? It is completely useless except for cutting your own fingers. Either make the full blade serrated or a fine edge. Now I feel much better.